MAHADEVYAICHA VIDMAHE SARVA SAKTHYAICHA THEEMAHI THANNO DEVI PRACHODAYATHU. This year Navrathri Pujai starts on Wednesday, the 28th September. There is a practice to arrange Dolls/Golu Padi on Mahalaya Amavasya day, which is considered auspicious day. Also Kalasa Sthapana is done on that day, choseing an auspicious time. The Pujai starts from the next day (i.e.) Pradamai and continues till Navami. Thus nine days pujai and it marks nine nights which is Navrathiri.The tenth day being Dasami is celebrated as Vijaya Dasami. This year the first day of Navrathri falls on Wednesday and the Star is Hastham. I prepared a fresh chart making changes in the last year's chart, as the prasadam offered on "day one" changes in regard to Kizhamai (day) , Star (Nakshatram) and Navagraham . Other details remain the same. I am posting the chart for first three days, to make it convenient for us to refer and keep things ready and be prepared for the puja by giving a glance on the 9 columns given against each day. The Thithi and Nakshatram on a day is based on the Sun rise and its duration during the day is determined seeing the almanac. Normally the puja is done in the morning, and the chances are for the thithi and star to last for very few minutes/hour, and also to overlap on a single day. This year this happens on fifth day of navrathiri.So Panchami and Sashti pujai and offering prasadam pertaining to thithi, and star is to be done on 5th day itself. 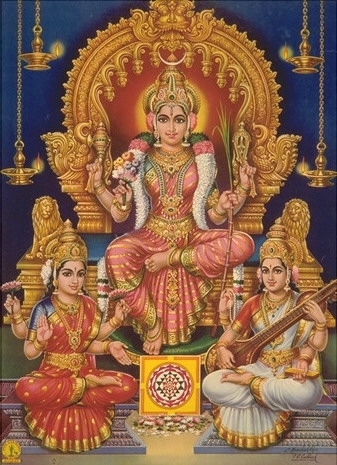 The reason is the Panchami thithi lasts for 8min from sunrise and Sashti thithi stars, which lasts upto 5.00am of next morning (3rd October),before sun rise. Since sashti thiti does not exist during sunrise Sapthami thithi puja and prasadam offering is to be done on 3rd October, followed by Ashtami and Navami on 4th and 5th october respectively. This year the Nine night festival is reduced to 8 nights and Ninth day is Vijaya dasami. My best wishes to all for a Happy Navrathiri and Devi pujai. Please see the following post. Timely post,useful information thank you for sharing!